Live like a Peacock! This beautiful limited-edition deck, the debut deck by creator Rocsana (featuring additional artwork by UK designer Phill Smith), is based on the shimmering elegance of the peacock. Printed by USPCC on their premium stock, the deck has a unique silver embossed tuck case and a red seal with the RT logo. The cards have a vivid fan-tail peacock display back for astounding visuals in both cardistry and magic performances, age marked standard USPCC court cards with a color palette shift to match the backs, a bespoke Ace of Spades showing two peacocks together, and two special peacock Jokers, one detailed with black linework and one in full color. In addition to these standard cards, the deck also comes with a double backed card and a mis-indexed red Queen, allowing a whole range of powerful magic presentations. 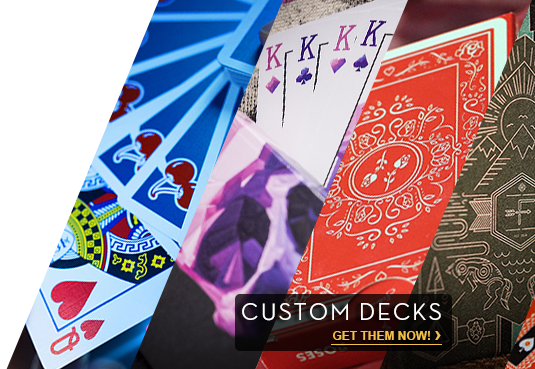 We are proud to announce the release of this stunning deck and we hope you enjoy using it. (Accessories shown for illustration purposes only and are not supplied).